Motto: "Where the North Shore begins"
The Town of Winthrop is a city in Suffolk County, Massachusetts, United States. The population was 17,497 at the 2010 census. Winthrop is an ocean-side suburban community in Greater Boston situated at the north entrance to Boston Harbor, close to Logan International Airport. It is located on a peninsula, 1.6 square miles (4.2 km2) in area, connected to Revere by a narrow isthmus and to East Boston by a bridge over the harbor inlet to the Belle Isle Marsh Reservation. Settled in 1630, Winthrop is one of the oldest communities in the United States. It is also one of the smallest and most densely populated municipalities in Massachusetts. It is one of the four cities in Suffolk County (the others are Boston, Revere, and Chelsea). It is the southernmost part of the North Shore, with a 7-mile (11 km) shoreline that provides views of the Atlantic Ocean to the east and of the Boston skyline to the west. In 2005, the Town of Winthrop voted to change its governance from a representative town meeting adopted in 1920 to a council-manager form of government. Under Massachusetts law, as of 2006 when the new Town Charter took effect, Winthrop became a city. However, it is one of 14 cities in Massachusetts that choose to remain known as a 'town.' It is therefore referred to as a 'town' in this article. Winthrop was settled in 1630 by English Puritan colonists as Pullen Poynt (Pulling Point), so named because the tides made hard pulling for boatmen. The present town is named after John Winthrop (1587–1649), second governor of the Massachusetts Bay Colony and an English Puritan leader. On April 8, 1630, Winthrop departed from the Isle of Wight, England on the ship Arbella, arriving in Salem in June where he was met by John Endecott, the first governor of the colony. John Winthrop served as governor for twelve of the colony's first twenty years of existence. It was he who decided to base the colony at the Shawmut Peninsula, where he and other colonists founded what is now the City of Boston. Originally part of an area called Winnisimmet by the native Massachusett tribe, Pullen Poynt was annexed by the Town of Boston in 1632 and was used as a grazing area. In 1637, it was divided into fifteen parcels of land that were given by Governor Winthrop to prominent men in Boston with the stipulation that each must erect a building on his land within two years. Few, if any, of these men ever lived on these parcels of land, but their farms prospered. One of these early houses, the Deane Winthrop House, was the home of Governor Winthrop’s youngest son, Deane, who lived there until his death in 1703. This house is still standing and is also the oldest continually occupied home in the United States. Although occupied, it is also open to the public at select times. The house is maintained by the Winthrop Improvement and Historical Association. In 1739, what is now Chelsea, Revere, and Winthrop, withdrew from Boston due to governmental control disputes and became the Town of Chelsea. In 1775, residents of the Town of Chelsea played a key role in the Battle of Chelsea Creek of the American Revolutionary War. Again, the desire for more local control resulted in Revere and Winthrop seceding from Chelsea in 1846 to become North Chelsea. Shortly thereafter, in 1852, Winthrop was incorporated as a town in its own right with a Board of Selectmen and Open Town Meeting form of government. In 1920, Winthrop was the second town in the Commonwealth of Massachusetts to apply for and receive a Charter for a Representative Town Meeting, which continued to 2006. As noted above, Winthrop adopted a home rule charter in 2005 with a council-manager form of government and is no longer governed by a representative town meeting. It is now legally a city, but chooses to be known as a town that has a city form of government. The new Town Charter, which took effect in 2006, was passed in a special election. The Board of Selectmen and Town Meeting were abolished, and legislative powers were vested in an elected Town Council. Executive power, largely ceremonial, resides in the Council President, who is popularly elected. An appointed Town Manager serves as the head of administrative services. On July 26, 2007, the Winthrop Sun Transcript reported that a movement was beginning to abolish the Town Council and return to a Representative Town Meeting - which would thus revert Winthrop from a city back into its original status as a town. The multistage process to reverse the changes made by the 2006 charter is considered complex, so it remains to be seen what form of government Winthrop will adopt going forward. According to the United States Census Bureau, the town has a total area of 8.3 square miles (21.5 km²), of which, 2.0 square miles (5.2 km²) of it is land and 6.3 square miles (16.3 km²) of it (76.02%) is water. However, according to the Town Government, Winthrop has a land area of just 1.6 square miles (4.1 km2). 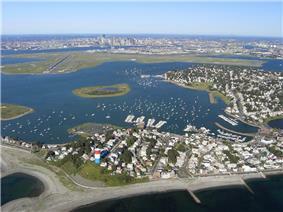 Winthrop is connected by land skirting the Belle Isle Marsh Reservation, which is shared across the Belle Isle Inlet with East Boston. The town was originally separated from Deer Island. Although still an island by name, Deer Island has been connected to Winthrop since the former Shirley Gut channel, which once separated the island from the town, was filled in by the New England Hurricane of 1938. The town is considered the northern dividing line between Boston Harbor to its west and Massachusetts Bay to its east. The town is divided into several neighborhoods with a central downtown area, including Court Park and Cottage Park along the Boston Harbor side of town, Point Shirley, Cottage Hill, Winthrop Beach, Ocean Spray and Winthrop Heights on the Massachusetts Bay side. The town is bordered by Revere to the north, and Boston on the northwest, west, and southeast. The water rights of the town extend to the edge of the county, and border those of Nahant in Essex County. As a result of the expansion of Logan International Airport, part of four of the runways (4L/22R, 4R/22L, 15R/33L and most of 15L/33R) lies within what was once the water rights of the town. By land, Winthrop is 5.5 miles (8.9 km) from Beacon Hill, the measuring point for all road signs in Massachusetts. 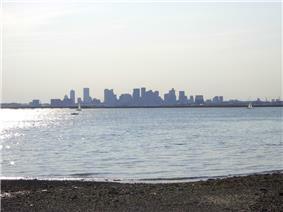 Deer Island, though within the city limits of Boston, is located in Winthrop Bay. It ceased to be an island in the 1930s when Shirley Gut, which separated it from Winthrop, was filled in. The island has a sordid past as an internment camp for Native Americans during King Philip's War, a quarantine station where many immigrants died, and the site of a county jail. Today, the island is home to the mammoth Deer Island Waste Water Treatment Plant, which provides sewage treatment for the Boston area. In spite of the presence of the water treatment plant, Deer Island has been part of the Boston Harbor Islands National Recreation Area since 1996 and the remainder of the island consists of park land and offers walking, jogging, sightseeing, picnicking, and fishing. Part of the park land consists of a man-made earthen berm that partly conceals the treatment plant from view from Winthrop. The island is now popular with many Winthrop residents due to the effective park landscaping and spectacular views of Boston Harbor and the Atlantic Ocean. Massachusetts Route 145 passes through the town as its only state route and the only connection to the mainland (via Main Street and Winthrop Parkway at opposite ends of town). It enters from the Orient Heights neighborhood of East Boston then passes in a loop around the main body of the town (bypassing Cottage Hill and Point Shirley) before leaving the town to the north, turning into the Winthrop Parkway in Revere. Two bus routes are provided by Paul Revere Transportation, which run from Point Shirley through the highlands and center of the town and terminate at Orient Heights. Paul Revere Transportation has operated the bus service in town since 1991. The service, which is subsidized by the MBTA, operates as Route 712 Point Shirley or Winthrop Beach to Orient Heights Station via Winthrop Highlands and Route 713 Point Shirley or Winthrop Beach to Orient Heights via Winthrop Center. This service does not accept MBTA Charlie Cards. Prior to this, the service was operated by Rapid Transit, which began bus service in Winthrop on January 28, 1940, the day immediately following the abandonment of the former Boston, Revere Beach & Lynn "Narrow Gauge" Railroad. The Blue Line of the MBTA subway system crosses near the town, with stops at Orient Heights Station, Suffolk Downs Station, and Beachmont Station, all of which are just a half mile from the city limits. A water transportation dock is located at the public landing and provides ferry service across Boston Harbor. Currently, Boston Harbor Cruises operates the service seasonally (May through October) between Winthrop and Rowes Wharf. As of the census of 2000, there were 18,303 people, 7,843 households, and 4,580 families residing in the town. The population density was 9,208 people per square mile (3,551.2/km²). There were 8,067 housing units at an average density of 4,058.5 per square mile (1,565.2/km²). The racial makeup of the town was 94.44% White, 1.68% Black, 1.15% Asian, 0.16% Native American, 0.04% Pacific Islander, 1.36% from other races, and 1.16% of two or more races. Hispanic or Latino of any race comprised 2.69% of the population. There were 7,843 households of which 23.6% had children under the age of 18 living with thim, 43.1% were married couples living together, 11.5% had a female householder with no husband present, and 41.6% were non-families. 32.5% of all households were made up of individuals and 11.9% had someone living alone who was 65 years of age or older. The average household size was 2.3 and the average family size was 2.98. In the town the population was spread out with 18.6% under the age of 18, 7.3% from 18 to 24, 33.2% from 25 to 44, 24.4% from 45 to 64, and 16.5% who were 65 years of age or older. The median age was 40 years. For every 100 females, there were 88.8 males. For every 100 females age 18 and over, there were 86.3 males. The median income for a household in the town was $53,122, and the median income for a family was $65,696. Males had a median income of $42,135 versus $36,298 for females. The per capita income for the town was $27,374. About 3.3% of families and 5.5% of the population were below the poverty line, including 4.1% of those under age 18 and 8.0% of those age 65 or over. Winthrop has a town center with a number of businesses, including Ace Hardware, CVS Pharmacy, and the United States Postal Service. By the mid-1990s, large shopping malls in the nearby North Shore region of Massachusetts, especially Square One Mall in Saugus, began to drain small businesses though a strong small business community still prevails. Located on Great Head (Water Tower Hill) is the Winthrop Water Tower. It is a red, white, and blue striped water tower capable of holding 1 million US gallons (3,800 m3) of water. It is maintained by Winthrop's Water Department. The town is divided into four unique business areas: the Shirley Street Business District, the Highlands District, the Center, and Magee's Corner District. Winthrop has a weekly newspaper, the Winthrop Sun Transcript, which reports local news, current events, happenings, and town concerns. Winthrop Senior High School, Grades 9–12, which is located on Main Street. Winthrop Middle School, Grades 6–8, which is located on Pauline Street. Arthur T. Cummings Elementary School, Grades 3–5, which is located on Hermon Street. William P. Gorman/Ft. Banks Elementary School, Grades PK-2, which is located on Kennedy Drive. The town also has numerous early education options including preschools and day cares. The majority of Winthrop residents are adherents of various Christian denominations, such as Roman Catholicism, Methodism, and Episcopalianism. Adherents of Judaism make up a small, but historically significant, minority. Over the past four decades, the once large Jewish community has dwindled due to frequent migration to other parts of Massachusetts. 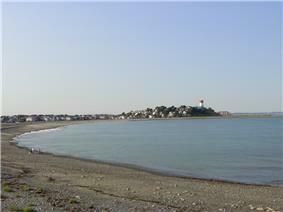 Winthrop has numerous beaches due to its geographic location, surrounded by water. There are two major beaches, Winthrop Beach and Yirrell Beach. Others include Donovan's Beach, Halford Beach, Pico Beach, Point Shirley Beach, and Short Beach. Winthrop is home to two historic military forts, Fort Banks and Fort Heath. Fort Banks was a United States Coast Artillery fort, which served to defend Boston Harbor from enemy attack from the sea and was built in the 1890s during what is known as the Endicott period, a time in which the coast defenses of the United States were seriously expanded and upgraded with new technology. Fort Heath was built in 1898 also as a Coast Artillery fort. It is now replaced with the Fort Heath Apartment building, Seal Harbor condominia, and a small park on the bluff overlooking the Atlantic Ocean and Revere Beach. Winthrop has five places on the National Register of Historic Places. Among numerous baseball fields and recreational parks, Winthrop's recreational facilities include Larsen Rink, an indoor ice skating rink, and Winthrop Golf Course, a private 9-hole, par 35 golf course. See also Category:People from Winthrop, Massachusetts. ^ . Secretary of the Commonwealth of Massachusetts. Retrieved on 2013-25-12. ^ Town of Winthrop, MA - About Winthrop. Town.winthrop.ma.us (2007-08-20). Retrieved on 2013-09-18. ^ Hall, Charles W. (1902). "Historic Winthrop, 1630-1902". Retrieved 31 December 2013. ^ Massachuset. Dickshovel.com. Retrieved on 2013-09-18. ^ "Deer Island Factsheet". Boston Harbor Islands Partnership. Archived from the original on June 29, 2006. Retrieved August 21, 2006. ^ > Schedules & Maps > Private Bus. MBTA. Retrieved on 2013-09-18. ^ "1990 Census of Population, General Population Characteristics: Massachusetts". US Census Bureau. December 1990. Table 76: General Characteristics of Persons, Households, and Families: 1990. 1990 CP-1-23. Retrieved July 12, 2011. ^ "1980 Census of the Population, Number of Inhabitants: Massachusetts". US Census Bureau. December 1981. Table 4. Populations of County Subdivisions: 1960 to 1980. PC80-1-A23. Retrieved July 12, 2011. ^ "1950 Census of Population". 1: Number of Inhabitants. Bureau of the Census. 1952. Section 6, Pages 21-10 and 21-11, Massachusetts Table 6. Population of Counties by Minor Civil Divisions: 1930 to 1950. Retrieved July 12, 2011. ^ "1920 Census of Population". Bureau of the Census. Number of Inhabitants, by Counties and Minor Civil Divisions. Pages 21-5 through 21-7. Massachusetts Table 2. Population of Counties by Minor Civil Divisions: 1920, 1910, and 1920. Retrieved July 12, 2011. ^ "1890 Census of the Population". Department of the Interior, Census Office. Pages 179 through 182. Massachusetts Table 5. Population of States and Territories by Minor Civil Divisions: 1880 and 1890. Retrieved July 12, 2011. ^ "1870 Census of the Population". Department of the Interior, Census Office. 1872. Pages 217 through 220. Table IX. Population of Minor Civil Divisions, &c. Massachusetts. Retrieved July 12, 2011. ^ "1860 Census". Department of the Interior, Census Office. 1864. Pages 220 through 226. State of Massachusetts Table No. 3. Populations of Cities, Towns, &c. Retrieved July 12, 2011. ^ "1850 Census". Department of the Interior, Census Office. 1854. Pages 338 through 393. Populations of Cities, Towns, &c. Retrieved July 12, 2011. ^ Welcome to Temple Tifereth Israel of Winthrop, Massachusetts. Jewishwinthrop.org (2013-09-01). Retrieved on 2013-09-18. ^ Congregation Tifereth Abraham | Jewish Boston Resources. Jewishboston.com. Retrieved on 2013-09-18. ^ St. John the Evangelist Church | An Archdiocese of Boston Parish in Winthrop, MA. Stjohnswinthrop.org (2013-08-13). Retrieved on 2013-09-18. ^ Holy Rosary Catholic Parish. Holyrosaryparish.net. Retrieved on 2013-09-18. ^ Home. Stjohnsepiscopal-winthropma.org. Retrieved on 2013-09-18. ^ First Church of Winthrop, United Methodist. Gbgm-umc.org. Retrieved on 2013-09-18. ^ Community Christian Church of Winthrop. Kingdomspirit.tv. Retrieved on 2013-09-18.